This picture show Knut Haugen from Fagernes and his Harley Davidson D-1238, an early twenties 61" (1000cc) magneto model w. acetylene lights. 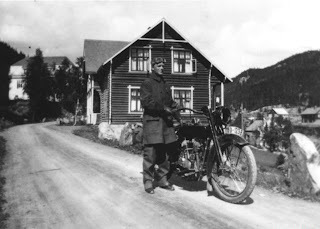 Bike is equipped with John Manville speedo, made for Harley in the earlier part of the 1920íes. As this is a magneto model there is a manual Klaxon horn mounted on the handlebars. These horns where named "Oogah"-horns, guess why!